I honestly don’t think 197,000 miles is that remarkable. As I said about a year and a half ago, I think you should be able to get 200k out of a car. I know many, many people who have gotten that (or better) from a car, and I’m disappointed that I didn’t quite get there on my car. But oh boy, you tell someone you’ve got an 11 year old car and they act like you’ve unearthed a wooly mammoth or something. Oh man. They just cannot believe it. Unfortunately, however, my long-time companion finally needed a costly repair, and it was time to put him to bed. 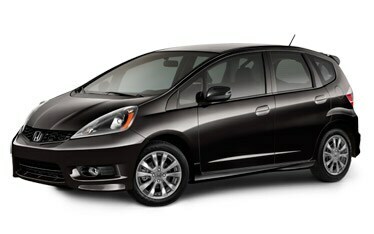 So last weekend we bought a brand new Honda Fit. First off, yes, I am quite aware that it’s teeny tiny. It’s quite a bit smaller than the Malibu. Yes, I agree we might be crazy. We did start off looking at small SUVs, honest, but the more we thought about it the more we realized that it just didn’t pay to cart around all that extra cargo space when the vast majority of the time it’s just me driving by myself. The Fit is exactly the size we need, and not an inch more (you may have noticed that’s something I’m kind of into). And for the handful of times a year when we need some extra storage? We plan to add a roof rack shortly. Second off, I’m about to eat some serious crow here. I am on record many, many times saying that I don’t think it makes sense to buy a new car; that used is always better. I was so absolutely sure I would never again buy a new car, and here I am with a new car. I had my reasons that made sense to me, but I guess the point is that everybody has ideas that make sense to them, and who am I to say their reasons were less valid than my reasons? Furthermore, I’ve spent most of my life defending American cars. I still defend them; 11 years and 197,000 miles without major problems says it all. But now here I am buying a foreign car. More crow. It doesn’t taste good. At the end of the day, when we added up all of our requirements such as price, mpg, reliability, interior dimensions, etc. this is just the car that fell out. It was the right choice. And it better be, since I plan on having this car FOREVER. Sara really brought this home with the sobering thought that this might be the car that Evie learns to drive on. Heavy. As with all “downsizing”, it might require lifestyle changes. We might need smaller car seats. We might need to make some hard choices on what we can bring with us and what we can’t. We might have to think about space and how we use it, and the difference between “need” and “want”. At least I hope so. I’ll talk tomorrow about the actual process of buying the car, which was predictably difficult, but I have to say it is very nice not to have to worry about little noises the car might make and what they might mean. I didn’t realize I was carrying that burden until it was lifted. We went from a car with 197,000 miles on it to one with 5 miles. That’s…a big difference. Unfortunately, there’s nothing to break a car in like a nice snowstorm (for the last time kids, keep your boots off those brand new seats!) and it’s already pretty disgusting. Oh well, might as well get used to it! Pingback: New Car Update | Is this thing on? Pingback: A smelly weekend | Is this thing on?